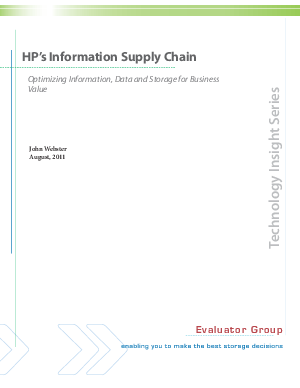 In this paper sponsored by HP and Intel, we examine each of the major technologies in the Information Supply Chain that should be considered as part of an integrated strategy and then show how they interrelate. Understanding the interrelationship between the three elements will allow trade-offs to be made between them such that the best economics can be achieved while meeting the business needs. We then examine HP and Intel's storage product portfolio as an example of how primary, secondary, and archival storage systems can be integrated with data and storage management software to yield an Information Supply Chain.